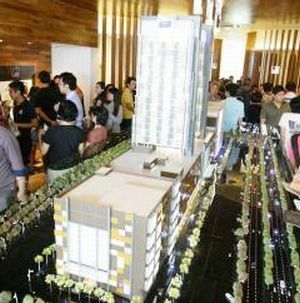 Bustling: The special preview and launch of Atria SOFO suites attracted a lot of buyers. DEVELOPER of the Atria@Damansara, OSK Property Holdings Bhd, hit the ground running when its Atria SOFO Suites were sold out just after its launch recently. The 392 SOFO (small office flexible office) units are part of the 2.23ha freehold mixed development project replacing the Atria shopping centre. Scheduled to complete in 2014, the project also features a shopping gallery and entertainment facilities. Housed in two 16-storey towers above the retail floors, its built-up size ranges from 488 sq ft to 1,343 sq ft. Depending on the size, each unit is priced from RM360,800 to RM1mil. Some of the unique selling points of the SOFO units are their modular design for better space planning, high ceilings at approximately 2.8m, vertical void for better ventilation and garden terraces on selected floors. Company director Ong Ju Xing said the development complemented the mature neighbourhood very well as it catered to the middle and upper class segments. He added that tenants from the former Atria shopping centre had also expressed interest in the new shopping gallery. “We believe the development project will cater and complement the mature and affluent township of Damansara Jaya,” he said during the launch. The project has a gross development value of close to RM1bil. UEM Land CEO says the company is optimistic on hitting the property sales target. KUALA LUMPUR: UEM Land Holdings Bhd, the country's biggest property player by market capitalisation, aims to sell RM3 billion worth of properties next year, an increase of 40 per cent from this year. Managing director and chief executive officer Datuk Wan Abdullah Wan Ibrahim said the company was optimistic on hitting the sales target. "We are confident as we have the right products to offer in the market. We are close to achieving this year's sales target of RM2.2 billion," said Wan Abdullah. The merger with Sunrise Bhd has also raised UEM Land's profile, given the former's expertise in high-rise integrated developments and branding. For the year ended Dec 31, 2010, UEM Land posted a net profit of RM194.5 million on a revenue of RM469.7 million. Maybank Investment Bank expects the company to record a strong 37 per cent growth in net profit in 2011, mainly due to the consolidation of Sunrise's earnings. Wan Abdullah said UEM Land had launched projects worth close to RM11 billion in the past four years and RM10 billion of that would be realised over the next few years. "We have projects worth RM34 billion to be launched over the next several years," he said after unveiling the RM1.3 billion Angkasa Raya, Sunrise's new landmark project in the Kuala Lumpur city centre, last Tuesday. 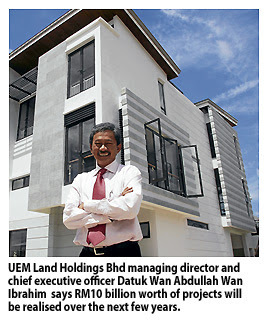 UEM Land is the property arm of UEM Group, which owns 69.1 per cent of the company. UEM Group, in turn, is wholly owned by Khazanah Nasional Bhd. The company became the biggest property player on Bursa Malaysia after buying Sunrise earlier this year. It now has a market capitalisation of about RM11 billion. UEM Land is currently developing Nusajaya, one of the five flagship zones of Iskandar Malaysia in Johor. Nusajaya spans 9,662ha, with UEM Land owning 4,161ha that are under various stages of development. UEM Land also has projects in Bangi, Cyberjaya, Kajang and Mont'Kiara. SINGAPORE: CapitaLand Ltd, South-East Asia's largest property developer, may place its US$5.3bil projects in China into a real estate investment trust (Reit), The Straits Times reported yesterday, quoting a senior executive of the company. CapitaLand chief operating officer Lim Ming Yan said should the company decide to do that, the plan would not happen in the near future because five out of seven of its projects, under its Raffles City brand, in China were still under development, according to the report. “That's always an option, obviously, but you have to wait for the right market timing. I think it's still too early. We have two operating Raffles City (projects) in China, the other five are still under development,” Lim said. CapitaLand, 40%-owned by Singapore state investor Temasek Holdings, said the projects, with a total commercial floor area of more than 2.1 million sq m, were expected to be worth S$7bil (US$5.33bil) in total upon completion, the report said. Lim also said the company was looking to start a few new private-equity funds, but did not give further details, it said. CapitaLand was not immediately available for comment. BEIJING: China will maintain restrictions on the property market, vice-premier Li Keqiang has said, despite growing speculation that curbs could be eased to prevent a damaging slump in prices. Real estate sales and prices have been falling nationwide due to tough restrictions on purchases and bank lending, fuelling fears that the market could collapse and send debt-laden property developers to the wall. China’s property market was “in a key stage” and restrictions needed to stay in place to “promote the healthy development” of the sector, the official Xinhua news agency quoted Li as saying on Sunday. “We must maintain policies to prevent property prices from rising overly fast and further consolidate the results of the controls,” Li said. China has introduced a range of measures aimed at bringing down property prices the last year, such as bans on buying second homes in some cities, hiking minimum down-payments for buyers and introducing property taxes. A surge in bank lending in recent years has fuelled investment in the real estate sector and pushed property prices out of the reach of many ordinary Chinese, angering people struggling to buy their first home. The government would maintain restrictions and step up construction of low-cost housing to “satisfy the multiple and diversified housing needs of the public,” Li said. Li’s remarks echoed those of Chinese Premier Wen Jiabao, who recently said house prices should return to “reasonable levels” before policies were eased. Renmin University in Beijing said last week it expected the government to relax some property market curbs next year due to concerns that slumping prices could hurt growth in the world’s second largest economy. Cash-strapped local governments were heavily reliant on revenue from land sales, and the central government would likely intervene to prevent property prices from falling more than 25%, it said in a report. Property investment was also a contributor to economic growth, so Beijing might act to help ensure gross domestic product growth – which creates jobs and prevents social unrest – remained strong, it said. Official data showed the number of major Chinese cities posting a drop in home prices doubled to 34 in October from September, in a sign efforts to cool the country’s surging property market are working.